A book from the publisher of THE NEW SOCIAL WORKER: THE MAGAZINE FOR SOCIAL WORK STUDENTS AND RECENT GRADUATES. 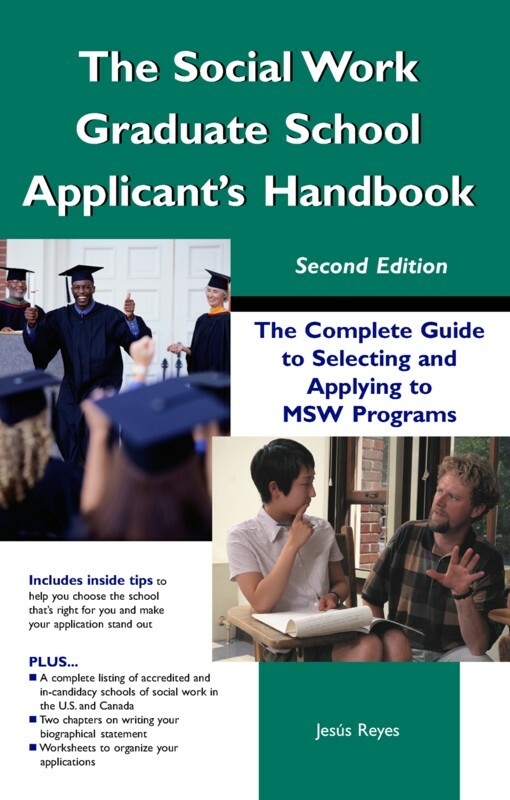 Click here to order the Kindle edition of The Social Work Graduate School Applicant's Handbook: The Complete Guide to Selecting and Applying to MSW Programs. Order the print edition from our online store. Are you thinking about getting a master’s degree in social work? Find out from a former admissions director how you can improve your graduate school application. In The Social Work Graduate School Applicant's Handbook, you will learn about the admissions process from an insider’s perspective. You will discover what will help (and hurt) your chances of being accepted to the school of your choice, and you will find tips on deciding which school is right for you. • What factors to consider when determining your interest in a school of social work • What admissions committees look for in an applicant • Whether your GPA and test scores matter • How to gain social work related experience that will help your application • Who to ask for letters of reference (and who not to ask) • What to include in your personal essay • Which schools are accredited by the Council on Social Work Education, and why this is important • Where to find out about social work licensing in your state. SPECIAL FEATURE—schools of social work provide tips to applicants and tell the most common mistakes applicants make, and also provide information about their programs! My social work education and experiences...have been invaluable to me as an elected official.... Pursuing a career in social work, specifically at the master's level, deserves serious reflection, research and the utilization of as many informational resources as you can find. Mr. Jesús Reyes' book provides you with both general information and specific advice on how to make an informed choice on which educational institution to attend. I urge you to give yourself time to digest the information provided by Mr. Reyes and go with your heart, wherein your strength lies. If you are applying to MSW programs, Reyes' guide...will quickly become a favorite resource. THANK YOU! THANK YOU! This book was exactly what I needed and what I was looking for. It has the answers to my questions and helped alleviate some of my fears about applying to graduate school. ABOUT THE AUTHOR: Jesús Reyes, AM, ACSW, is Director of the Social Service Department of the Circuit Court of Cook County, Illinois. As former assistant dean for enrollment at one of the top ranked schools of social work in the United States, the University of Chicago School of Social Service Administration, and as a private consultant to MSW applicants, he has advised thousands across the country on their school applications and personal statements and on ways to improve their chances of getting into the school of their choice.